Note: This is the EPUB edition of the book. Take performance to the next level! This book does not just teach you how the CLR works—it teaches you exactly what you need to do now to obtain the best performance today. It will expertly guide you through the nuts and bolts of extreme performance optimization in .NET, complete with in-depth examinations of CLR functionality, free tool recommendations and tutorials, useful anecdotes, and step-by-step guides to measure and improve performance. This second edition incorporates the advances and improvements in .NET over the last few years, as well as greatly expanded coverage of tools, more topics, more tutorials, more tips, and improvements throughout the entire book. 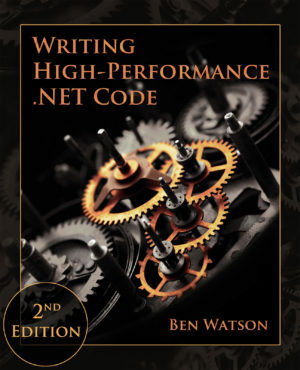 New examples, code samples, and diagrams throughout entire book. More ways to analyze the heap and find memory problems. More tool coverage, including expanded usage of Visual Studio. New .NET features such as ref-returns, value tuples, SIMD, and more. More detailed analysis of LINQ. Tips for high-level feature areas such as ASP.NET, ADO.NET, and WPF. Profiling with multiple tools to quickly find problem areas. Detailed description of the garbage collector, how to optimize your code for it, and how to diagnose difficult memory-related issues. How to analyze JIT and diagnose warmup problems. Effective use of the Task Parallel Library to maximize throughput.